Khafdh means to cause descending; Raf‘ means to exalt or elevate. Allah says, “Many will it bring low, many will it exalt.” (WAQI‘A, 3), meaning that Allah exalts the believers and abases the pagans, and He says, “And out of kindness lower to them the wing of humility.” (ISRAA’, 24), urging people to treat parents with kindness and affection. Allah says, “..but lower thy wing in gentleness tothe believers.” (HIJR, 88), “..We raised over them the towering height of Mount Sinai.” (NISAA’, 154), “And remember Abraham and Ismail raised the foundations of the House” (BAQARA, 127), “..andWe raise some of them above others in ranks.” (ZUKHRUF, 32), “By the Canopy Raised High.” (TUR, 5), “..God will raise up to the suitable ranks and degrees, those of you who believe and who have been granted mystic Knowledge.” (MUJADILA, 11). From the previous verses it is manifest that (abasing) and (exalting) can be concrete as well as abstract, for instance, prestige and honour, fame and glory. 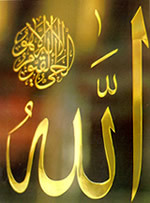 Of these two names of Allah (the ABASER, EXALTER), it is said that Allah, Praise and Glory be to Him, abases the pagans by agonizing them and elevates the believers by bestowing blessings on them; He exalts the believers by nearing them and degrades His enemies by keeping them at a distance. Allah exalts with His Favours and Honours whom it pleases Him to exalt, and degrades with His Vengeance the rank of whom it pleases Him to degrade; He abases His enemies by humiliation, and exalts His worshippers by victories; He elevates the truth and abases the evil. The two names are epithets of His Divine Acts and are related to His Divine Will and Power, Glory be to the ABASER and the EXALTER, Praise and Glorybe to Him, He is Allah. «(21) The WITHHOLDER (AL-QABIDH) (22) The ENLARGER..